While I was 38 weeks pregnant with my third, I lead a two-week parenting group on “Creating a Culture of Care” in Midtown Manhattan. I drew heavily on the work of Harvard Psychologist Richard Weissbourd, who runs the Making Caring Common Project. 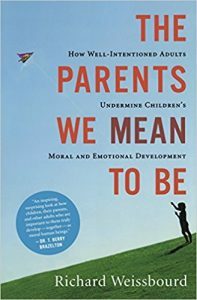 Weissbourd poignantly writes that if we want our children to be moral, we have to raise them that way. Today I am super stressed with several deadlines, a toilet that simply won’t fix (4 year old may or may not have stuck crafting stamps down it), a sick toddler, not enough childcare, not enough sleep, a longing to be in Albany or DC launching the Poor People’s Campaign, no groceries…you’ve got a similar list. Today I feel like I failed my children, who truly are counting on adults to help them become. Thank God for parents who are in town who took them to the park, and for the spark of imagination I can hold onto for what tomorrow can bring. Are you familiar with Weissbourd’s work or the Making Caring Common Project? I lift that up to you as well as his book, “The Parents We Mean To Be: How Well-Intentioned Adults Undermine Children’s Moral and Emotional Development.” If you’ve read it I’d love to know what you think! How do you deal with the stress of the reality that our young people are looking to us to model morality? How do you get a break when you need it?